: pops up [About Sena Bluetooth Device Manager] screen. : opens the Sena Bluetooth Device Manager Help. : select the manager software language. The [About Sena Bluetooth Device Manager] screen tells basic information about the manager including the version. The About screen pops up by pressing the [?] button at the top-left corner of the manager or selecting the [About] menu at the [Context Menu]. Users can view the Sena Bluetooth Device Manager Help by pressing the [Online Help] button in the [About Sena Bluetooth Device Manager] screen or selecting the [Online Help] menu at the [Context Menu]. Users can change the language for Sena Bluetooth Device Manager by pressing the flag icon at the top-right corner of the manager or by selecting the [Manager Software Language] menu at the [Context Menu]. 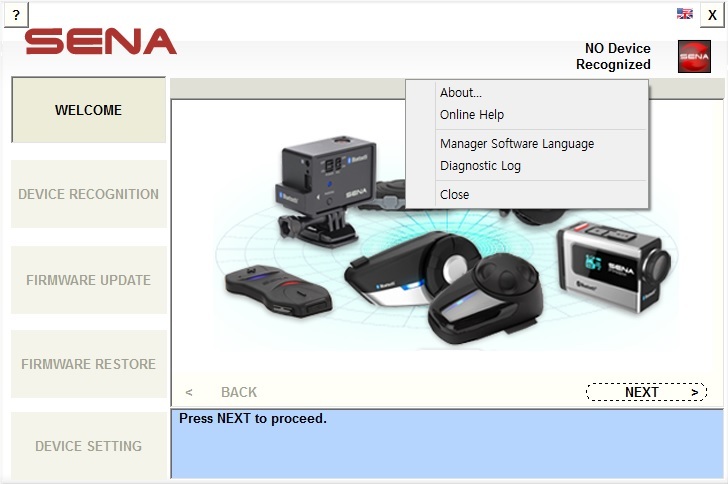 If it is the first time to run the Sena Bluetooth Device Manager after updating it, users are prompted to select the manager software language. Users can create diagnostic log by selecting the [Diagnostic Log] menu at the [Context Menu] and specifying log file name. Please send email for technical support with diagnostic logs which are created right before and right after failure happens. Users can close the manager by pressing the [X] button at the top-right corner of the manager or selecting the [Close] menu at the [Context Menu].